Were Hedge Funds Right About Souring On Teck Resources Ltd (TECK)? Insider Monkey has processed numerous 13F filings of hedge funds and famous investors to create an extensive database of hedge fund holdings. The 13F filings show the hedge funds’ and investors’ positions as of the end of the fourth quarter. You can find write-ups about an individual hedge fund’s trades on numerous financial news websites. However, in this article we will take a look at their collective moves and analyze what the smart money thinks of Teck Resources Ltd (NYSE:TECK) based on that data. Teck Resources Ltd (NYSE:TECK) was in 26 hedge funds’ portfolios at the end of the fourth quarter of 2018. TECK has experienced a decrease in hedge fund interest recently. 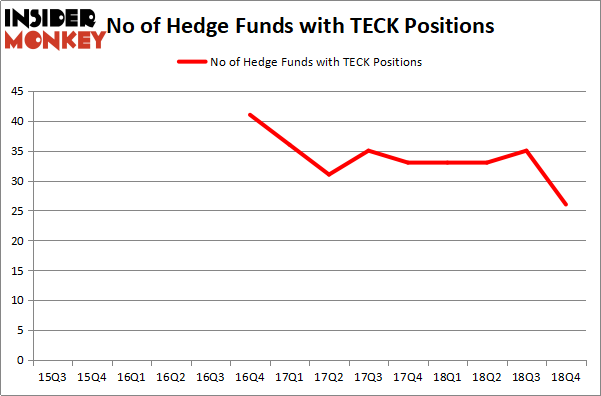 There were 35 hedge funds in our database with TECK holdings at the end of the previous quarter. Our calculations also showed that TECK isn’t among the 30 most popular stocks among hedge funds. 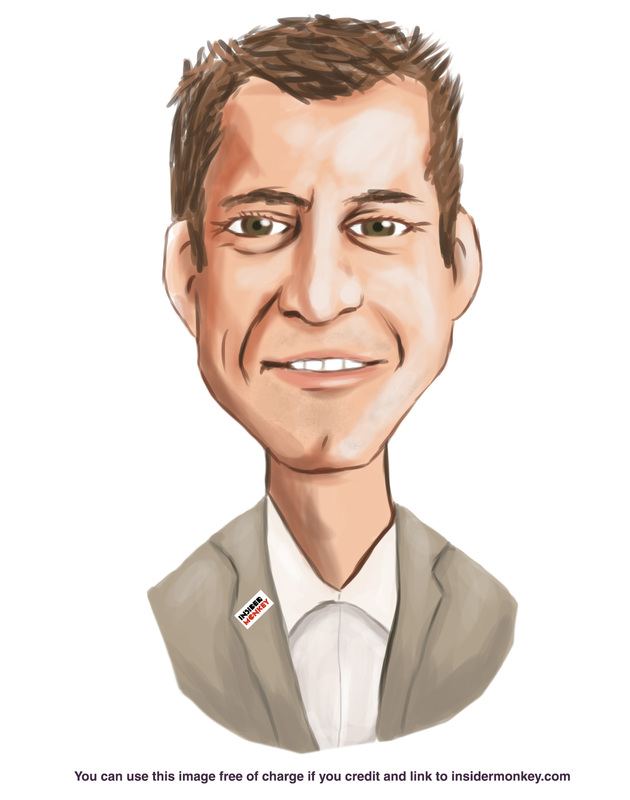 We’re going to check out the key hedge fund action regarding Teck Resources Ltd (NYSE:TECK). How have hedgies been trading Teck Resources Ltd (NYSE:TECK)? At Q4’s end, a total of 26 of the hedge funds tracked by Insider Monkey were bullish on this stock, a change of -26% from the second quarter of 2018. Below, you can check out the change in hedge fund sentiment towards TECK over the last 14 quarters. So, let’s review which hedge funds were among the top holders of the stock and which hedge funds were making big moves. Of the funds tracked by Insider Monkey, Robert Bishop’s Impala Asset Management has the number one position in Teck Resources Ltd (NYSE:TECK), worth close to $316.3 million, corresponding to 17.1% of its total 13F portfolio. On Impala Asset Management’s heels is Arrowstreet Capital, led by Peter Rathjens, Bruce Clarke and John Campbell, holding a $195.1 million position; the fund has 0.5% of its 13F portfolio invested in the stock. Other professional money managers that are bullish comprise Thomas E. Claugus’s GMT Capital, Israel Englander’s Millennium Management and D. E. Shaw’s D E Shaw. Since Teck Resources Ltd (NYSE:TECK) has witnessed declining sentiment from the smart money, logic holds that there lies a certain “tier” of fund managers that decided to sell off their full holdings by the end of the third quarter. Intriguingly, Ken Heebner’s Capital Growth Management dumped the biggest stake of the “upper crust” of funds watched by Insider Monkey, valued at an estimated $43.4 million in stock. John Horseman’s fund, Horseman Capital Management, also said goodbye to its stock, about $15.7 million worth. These moves are interesting, as total hedge fund interest was cut by 9 funds by the end of the third quarter. Let’s now take a look at hedge fund activity in other stocks – not necessarily in the same industry as Teck Resources Ltd (NYSE:TECK) but similarly valued. We will take a look at CDW Corporation (NASDAQ:CDW), The Liberty SiriusXM Group (NASDAQ:LSXMK), Discovery, Inc. (NASDAQ:DISCK), and Symantec Corporation (NASDAQ:SYMC). This group of stocks’ market caps resemble TECK’s market cap. As you can see these stocks had an average of 34.5 hedge funds with bullish positions and the average amount invested in these stocks was $1402 million. That figure was $1012 million in TECK’s case. The Liberty SiriusXM Group (NASDAQ:LSXMK) is the most popular stock in this table. On the other hand CDW Corporation (NASDAQ:CDW) is the least popular one with only 26 bullish hedge fund positions. Compared to these stocks Teck Resources Ltd (NYSE:TECK) is even less popular than CDW. Our calculations showed that top 15 most popular stocks among hedge funds returned 19.7% through March 15th and outperformed the S&P 500 ETF (SPY) by 6.6 percentage points. Unfortunately TECK wasn’t in this group. Hedge funds that bet on TECK were disappointed as the stock returned 0.3% and underperformed the market. If you are interested in investing in large cap stocks, you should check out the top 15 hedge fund stocks as 13 of these outperformed the market.